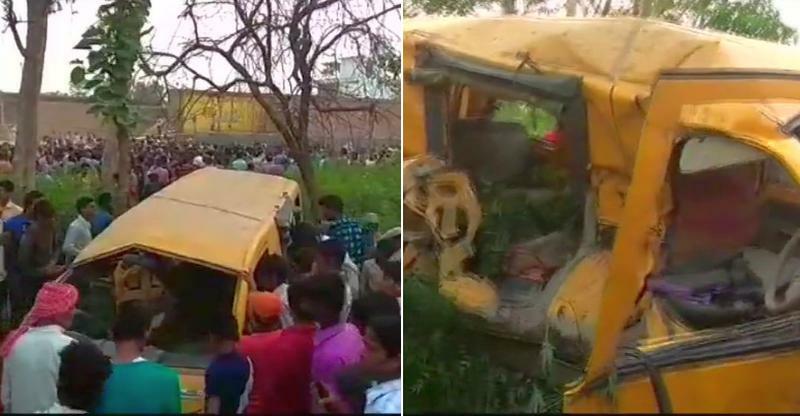 In a horrific accident that happened at Kushinagar, Uttar Pradesh, 13 kids tragically lost their lives as the school bus they were travelling in was hit by a train. The accident happened at an unmanned level crossing earlier today, at about 7:10 AM. The kids belonged to Divine Mission School, and there were nearly 25 kids crammed into the school van when the the accident happened. The injured children are being treated at Gorakhpur Medical College. There were nearly 25 school kids in the van. The children were on their way to their school when the incident took place. The incident took place near a rail crossing. The injured have been taken to the hospital. Many residents of the area had gathered when the incident took place. According to the DSP, the accident took place due to the carelessness of the driver, who was reportedly using earphones while driving. The bus was also overloaded, said the DSP. He also said that the exact number of children present inside the vehicle is yet to be ascertained. Other sources say that the driver of the school van was warned by onlookers, who asked him to stop, which he eventually did but right on the railway track, directly in the path of the oncoming train. Also, most children who died were said to be under the age of 10, almost all of whom succumbed at the spot, even before medical aid could reach them. Manned or unmanned, level crossings are dangerous because of the sheer momentum that passing trains carry. It’s always advisable to wait, check and proceed, even when a signal is green. Trains cannot stop quickly and if you find yourself in the path of an oncoming train, death or life threatening injuries are almost certain.